d. have limited financial resources as reflected in the documents presented and as attested to by the Principal/Dean, teacher/counselor. Note: An applicant with a sibling currently enjoying or has enjoyed financial assistance in the past is automatically disqualified. An applicant whose parents do not have fixed income or have no income at all should have a sponsor who can provide additional financial support. Financial assistance from SSC may not be enough to pay for all the tuition and fees and other school-related expenses. Applicants follow the regular procedure for seeking admission to the College. After having passed all admissions requirements of SSC, the applicant secures an application form from the Registrar’s and Grants Office. 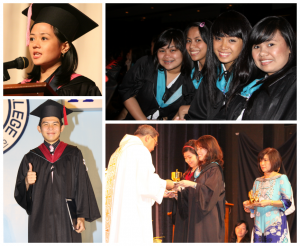 c. How can you be of service to SSC and society, especially after College? d. How can you support the Scholarships and Grants Program of SSC now and in the future? B. Come for an interview with the parent or guardian on a date to be arranged with the Registrar’s and Grants Office. An unannounced home visitation may be conducted to secure more information about the applicant.Investigation of the grantee’s lifestyle will be conducted from time to time. Note: Awarding of financial grants depends upon the availability of funds and/or slots. Therefore, applicants are processed on a FIRST-COME-FIRST-SERVED basis. Applicants with incomplete documents will be set aside until all requirements have been submitted. b. conforms satisfactorily to the rules and regulations of the School. c. renders the required number of service hours within the semester. S/He is expected to receive a favorable evaluation from the Department/Office s/he has been assigned to. (The grantee arranges his/her work schedule with the Office/Unit Head. Note: A grantee who fails to complete the required service hours within the semester may be placed on probationary status the following semester or will no longer be qualified to apply for the renewal of the grant. A grantee whose CQPA is 3.5 or higher may be exempted from the service hour requirement. A letter requesting approval of exemption is required. Exceptional cases may be allowed upon the recommendation of the Academic Dean or a Department Chairperson and with the approval of the Scholarships and Grants Committee. The grantee is expected to submit a written request for proper action and documentation. In some cases, the grantee shoulders the additional expenses related to such restriction. Shifting, dropping/adding a subject, cross-enrollment without approval is valid ground for termination of the financial assistance. Scholars/grantees are expected to enroll every semester except for valid reasons: health problems as certified by the school physician or serious personal problems which may affect the grantee’s academic performance during the semester/school year. SSC is under no obligation to grant scholarship or financial assistance to any student or individual.